Branding drives shareholder value. The primary objective of boardrooms is to build and sustain shareholder value, and deliver competitive returns to shareholders. Strong brands with unique appeal championed by passionate leaders are becoming the body and soul of modern businesses. These strong drivers of business growth are creating a new type of companies with a competitive edge. Comparison of the market capitalization of leading global firms with strong brands demonstrates that the market has put a premium on the growth opportunities of firms seeking to build individual or portfolios of international brands. Today, businesses and consumers are placing increasing importance on brands. For businesses, a strong brand is able to help a company differentiate itself from its rivals, stand out from the competition, influence a consumer’s purchase decision in the company’s favour, build customer loyalty and boost the company’s financial performance. For consumers, brands give them identity, stimulate their senses and enrich their life experiences. People have a need to affiliate and surround themselves with things they know well, trust and aspire to be. From a customer viewpoint, a brand is also a signal of quality and creates a bond of trust with the manufacturers behind them. Trust helps customers to reduce the inherent risks involved in any purchase, authenticating the source of the goods and serving as a strong promise of the perceived value of the goods sold. Asia is still one of the world’s biggest providers of commodities and many manufacturers still mostly produce non-branded goods for resale by other companies. In other words, these are volume products without personalities, values and distinct faces. Disregarding Japanese and Korean companies, there are only a few global brands originating from Asia compared to brands originating from Western companies. However, the time has come to change this somewhat historic and outdated trend. New Asia has finally emerged. Asia has changed dramatically over the last two decades and now represents strong product quality, a very well-educated and competent workforce, powerful financial sources, endless R&D capabilities, a passion for technology, gadgets and growing infrastructure in most countries. Furthermore, increasingly changing trade structures, including the development of free trade agreements throughout the region, or at least a changing attitude to barriers, and the glooming Chinese powerhouse are important supplementary factors which positions Asia firmly in the international arena. The drivers of globalization are a combination of many factors which have forced businesses to look outside their home markets for growth opportunities in new markets, and very often to gain economies-of-scale and to diversify their risk/reward balance. However, the competition in the global business environment is increasing and achieving a unique position and competitive advantage becomes more and more difficult and expensive. The high level of investment necessary to maintain production capabilities and rising cost of R&D for product differentiation efforts to steer clear of becoming generic puts totally new requirements on Asian companies and their management teams to cover these heavy investments. Creating and implementing global brand marketing strategies are inevitable for tomorrow’s successful Asian companies in order to capture a larger part of the financial value and enhance the profit streams. Additionally, strong branding enhances the competitive position in the market place and helps fight competition. Asian companies need to move up the value chain through strategic branding and they have all the capabilities needed to achieve this in the years to come. Trading mind set: Despite Asia’s rapid economic growth and integration with the global economy, the business mindset is still predominantly driven by short term sales and turnover. Managers in Asian firms are more comfortable investing in tangible assets than in intangibles such as brands and innovation. Although such an orientation has facilitated many Asian economies to achieve scale and scope economies in manufacturing sectors in the early part of Asian resurgence, that very orientation acts as a major deterrent in Asia’s current stride to build strong brands. A conservative mind-set focused on the tangible, the short-term and the risk-minimizing aspects of business has manifested in branding being relegated to an optional, tactical tool of marketing departments. As such, Asian companies have not fully realized the strategic role of branding and the role of corporate management, especially of the CEO, in instilling branding as an organization wide discipline. As a result of this, many of the biggest corporations of Asia have very diversified operations often in industries with no connection with one another. Though this provides these conglomerates an opportunity to leverage its scale and the power to dominate the market, it also puts immense pressure on them to maintain focus and compete in the respective industries. More importantly, establishing organizational identity becomes a challenge. Building brands is fundamentally about creating a strong organizational identity and as such, these companies have had difficulties given their multiple businesses. Government intervention: In many Asian economies, participation of national and local governments in the activities of home-grown businesses is very high. More often than not, their intervention is meant to tilt the competitive scale in favour of local enterprises. For example, it has been widely documented that the Chinese government has favourable lending procedures to Chinese companies compared to foreign companies. India, meanwhile, mandates that foreign brands may only enter a domestic market if they agree to a joint venture with local producers. Government influence can be both formal (through board appointments) and informal (through networks of influential personnel). Such influence, combined with the socialist or communist ideologies in many countries can mean that investing in branding may not be a priority. Intellectual property rights: The lack of stringent enforcement of protection of intellectual property has been a major challenge in building brands in Asia. The counterfeit market in many countries poses a very strong challenge for both local and global companies products not only undercut profits but dilute the overall brand. One of the main reasons for such a thriving counterfeit market is the lack of stringent intellectual property right laws. In their own backyard, many Asian companies face rampant infringement of IP rights. Unless legislation and law enforcement improve in the region, it may be a hurdle that prevents a deeper appreciation and respect for intangible asset management in the Asian boardroom. Lack of CEO support: The one reason, more than any other mentioned above, that influences the creation of strong brands is the mindset of the boardroom and the CEO. Branding is a boardroom discipline and successful brands can be built only when the boardroom, led by the chairman and the CEO, understands, appreciates and commits to treating branding as a strategic discipline and devotes resources to support the brand continuously. 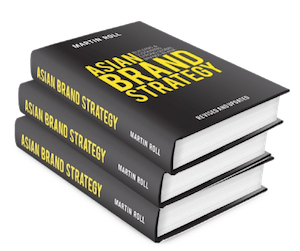 But with the average Asian CEOs lack of comprehensive understanding of branding as a strategic and boardroom-driven discipline, it is no surprise that Asia has not been able to build many strong brands. Some of the best known global brands are led by their CEOs acting as chief brand ambassadors. Those brands are strongly emphasized in and led by the boardroom, and the corporate strategies of these successful brands are well aligned with their branding strategies. When treated as strategic assets, any initiative is evaluated in terms of its potential impact on brand equity. Given the dominant management orientation of Asian CEOs and the institutional environments of Asian economies, Asian brands are not yet led effectively by CEOs. The discipline needs to be elevated to the boardroom level. Asia can play an important part of the global branding battle. Towards 2025, a rapid phase of change to the business landscape in Asia where the opportunities for Asian companies to benefit from global corporate and product branding efforts will be larger than ever before. The growing emphasis on international branding will move up the boardroom agenda become one of the most prominent drivers of value in Asia Pacific in the next two decades and branding will become a board room agenda. Businesses with a sustainable business model and with a visionary and passionate CEO with branding talent will benefit from the rising opportunities for taking on the global scene. But having branding know-how and marketing technology is no longer adequate. The modern Asian company leader needs to be a complete player who covers all grounds and have the vision to follow through and improve. Being a marketing wizard is no longer enough. One also has to be an excellent business leader and brand marketer with a truly international edge. Traditionally, new senior executives among the Asian companies are recruited from within the ranks of the organisations and they tend to come primarily from technology and/or financial related career backgrounds and departments. Much fewer are the talents coming along with in-depth and high-level marketing and branding backgrounds compared to Western companies. Therefore, many companies tend to lack experienced top-leaders who have spend their entire executive careers in marketing and branding hence bringing with them the important capabilities and international experience in the branding field. Therefore, many companies must reconsider the management teams in Asia and take on more highly skilled leaders with outstanding capabilities and global experience in branding strategy and marketing execution as well as talent with preferences for rapid change, new knowledge, insights and best global practices. All these factors are no longer a luxury but a necessity to win a lucrative position in the global branding battle. Asia has all opportunities at hand if business leaders and owners step up to the challenge.